Aggressive Grip. Smooth Handling. Impeccable Control. Introducing the S.driveâ„¢, a bold new addition to the Yokohama performance line-up. Packed with the latest technological advancements, the S.drive delivers extraordinary grip and handling. With over 70 different sizes, the broadest range of sport sedans and coupes can experience the latest performance upgrade from Yokohama. Construction may vary by size and/or speed rating. Tires are NOISY after just 5000 miles on it. Please do not buy too NOISY of a tire. Continental DWS better tire and quite. Tires that won't last but 2000 miles aren't worth $400/pair. I bought 2 Yokohama S-DRIVE for the rear of my M3. 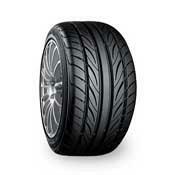 They are supposed to be the replacement for the Yoko AVS ES100 (great tire). The S-Drive doesn't hold a candle to the AVS ES100. I got 2000 miles out of the S-D and Yoko replaced them. The new set have 1530 miles on them and they won't last another week. Customer service in the US isn't what it used to be. Yoko won't stand behind their product either. I've been driving the AVS ES100 since 2003. It's too bad that Yoko replaced a great tire with a POS like he S-D which is clearly overrated. TREAD WEAR ON THIS TIRE IS ABOVE AVERAGE,GRIP IS GOOD AND NOISE IS LOW.I HAVE NO COMPLAINTS WITH THE S.drive TIRES SIZE 205/40R17.I will buy these tires again!